Works in progress, step-by-step and videos of StarTwo works. Here’s a sneak peek of the lines for an illustration of Alice, a character from the game series “Shin Megami Tensei”. More about her soon! This Friday let’s talk about Scotland’s Black Douglas. 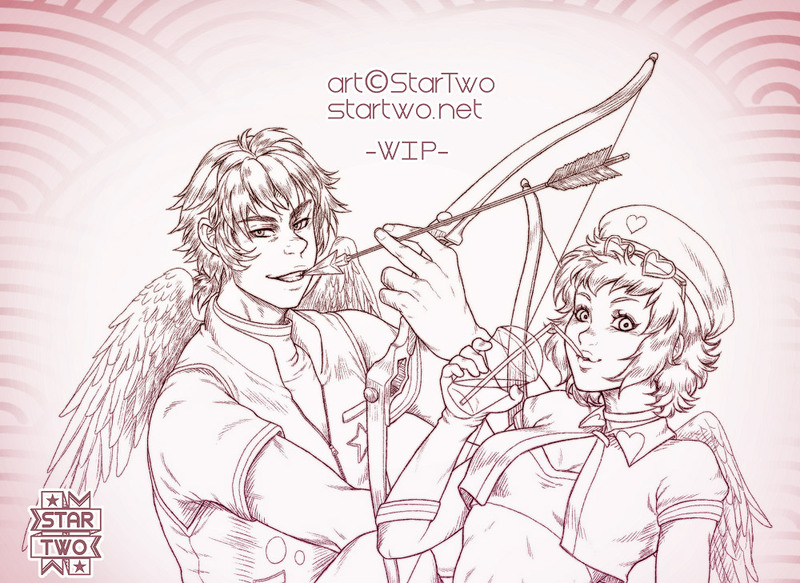 Today we bring you a little insight to the backstage work on our last post’s illustration for Valentine’s day (►here◄). As with every process, we started with discussing the idea and for this one we were set on wanting to use two of our original characters (cue Devon and Rayil!). From there we started making thumbnails of poses, filtering what worked and what didn’t and after locking the overall composition each one of us was assigned to sketch one of them while making sure they had the same language when it came to style. Inking was in a clean sketch approach, using the lines also to convey texture and hints of shadows, trying not to over saturate the notions of volume. We had used the technique before but revisiting it reminded us that we enjoyed this different method and feel there’s ample space to improve and it’s definitely something to explore more.